The Faroe Islands celebrates the same public holidays as Denmark as it is an autonomous country within the Kingdom of Denmark. But it has its own holidays as well. 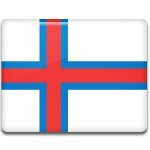 For example, April 25 is National Flag Day in the Faroe Islands. The flag of the Faroe Islands is called Merkið, which means “the mark” or “the banner”. It was designed in 1919 by three Faroese students, Jens Oliver Lisberg, Janus Øssursson and Paul Dahl. On June 22, 1919, Lisberg first raised the flag in his home town of Fámjin. The original copy of the flag can be seen in the church of Fámjin. Merkið received the official statues on April 25, 1940, when it was approved by the British occupation government as the civil ensign. The anniversary of this event is now celebrated as National Flag Day (Flaggdagur). The Danish government recognized the flag in 1948. The design of the flag is based on a red Nordic cross, resembling the flags of neighboring Iceland and Norway. The cross is fimbriated blue and located on a white field. Red and blue colors represent the archipelago's bonds with other Nordic countries, while white symbolizes the sea foam, the pure sky of the Faroe Islands and the creators of the flag. The ratio of the flag is typically 8:11.